Dharma Teacher Shang Ding, secularly named Liu Qun-Jin, also known as Hui-Qun, was born in a Hakka family, in Neipu Township, Pingtung Coutry in 1941. During the period of Japanese-rule, her youngest aunt, before becoming a monastic, was requested by the local gentry to practice Buddhism in Matsu Temple which was going to be demolished by the government. Later, her aunt was tonsured by Master Neng Jing of Chaoyuan Temple, Meinong, extending Kaiyuan’s Dharma lineage at Zhuxi. Dharma Teacher Shang Ding, before becoming a monastic, studied Buddhism under Master Xiu Miao, and helped build Miaojue Temple, Neipu in 1963. On July 1 of the same year, she became a monastic, and received the Triple Platform Ordination at Yuanshan Linji Temple, Taipei in 1966. At the age of 22, she studied in the Buddhist College affiliated with Baojue Temple, Taichung, for one year until the college was dissolved. Next, Venerable Shang Ding went to study at Lingquan Temple, Keelung. The faculty there was excellent. Besides Master Qing Xu, Elder Yin Hai and Master Yan Pei there were also Venerable Yin Shun’s able disciples. Within three years, they upheld Venerable Taixu’s triple learning approach and set up three major systems: Indian Buddhist History, Chinese Buddhist History, General History of the Eight Schools of Buddhism, and a Differentiation System of Buddhism, hence presenting more clearly the core and essence from various sects to the eight major schools of Buddhism. Therefore, Dharma Teacher Shang Ding, within three years, built up a solid foundation of Buddhism. In 1967, she enrolled in Taixu Buddhist College and studied for two years. In the third year, the college was moved back to Hsinchu and renamed Fu Yan Buddhist Institute, where the study environment was much better with much greenery. Fu Yan’s educational program was divided into Classes A (advanced) and B (advancing), featuring Hetu-vidya that was taught by Dharma Teacher Wei Ci. 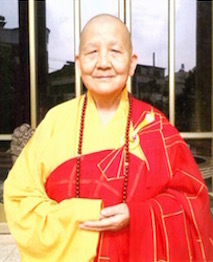 She explained the profound theories in a simple, lively language which was easy to understand, and helped Dharma Teacher Shang Ding lay a firm foundation in logic arguments. In 1973, she started to teach in Dongshan Buddhist College, Pingtung for six years. Later she meet Elder Hui Xing, who went to southern Taiwan to spread the Dharma. As a result, she listened to his teaching for over 30 years. Then around 1996, she went to Yuanheng Temple, Kaohsiung to teach Buddhism (The Outline of the Eight Schools of Buddhism, The Way to Become a Buddha, etc.) to students for two successive sessions. Meanwhile, she gave psychological consultation to the inmates in Pingtung Detention Center, and in 2004, she also taught in Ci En Buddhist College, Zhutian Township, Pingtung Country. As to the operation of the temple, in addition to the temple’s affairs and Buddhist funeral services for the followers, she in the 1990s held one or two Buddha-week programs in a year, and held Buddhist Summer Camps for college students for six years in a row. Those events attracted believers and also college students from the five universities in the neighborhood. They were National Pingtung University of Science and Technology, National Pingtung University, Yung Ta Institute of Technology and Commerce, Meiho University, and Tajen University. In 2006, she founded a Sutra Reading Class for children, which was conducted by Dharma Teacher Jing En for eight years. In 1994, she built Zhonglin Pure Hall, which she later donated to Fu Yan’s alumnus, Dharma Teacher Ru Zheng, because of understaffing. He converted the hall into a practice field for male monastics. The hall now is renamed Xianglin Temple and offers Buddha-chanting cultivation two days in a week and lectures on Buddhism on Saturdays. The activities try to teach the disciples to have a positive outlook towards Buddhist philosophy, keep precepts, chant the Buddha’s name, and do exercises inside and outside of the temple to cultivate blessings and wisdom, so as to posses physical and mental resources to spread the Dharma at ease. Now at 76 years old, she should retire and retreat to self-cultivation; however, there are so many senior citizens in the temple, so she holds two important tasks: spreading the Dharma and managing the temple. In 2016, she was elected as Chairperson of Pingtung County Buddhist Association, and she felt worried that she might not have the ability or enough money to do the job well. Fortunately, thanks to support from the Association’s Managing Director, Dharma Teacher Jian Yin, its directors and supervisors, and the lay people, she has run the association smoothly and benefited people.